‘Tis the season for making sweet and savory dishes and pies, hanging stockings, shopping, and spreading good cheer! The spirit of giving and receiving is alive and well this time of year. So after you have checked off everything on your to-do list, why not pamper yourself on a well-deserved holiday getaway? Horse-drawn sleigh rides, cookie-decorating workshops, lounging by the pool, and breakfast with Santa, are just some of the relaxing, festive, and exciting treats that B&Bs offer their guests during the holiday season. A memorable and merry time creating new traditions awaits you at one of these lovely inns. At Jekyll Island Club Hotel, located in Jekyll Island, GA, enjoy a first class holiday experience filled with lush comforts like large suites with whirlpool tubs, breathtaking views of manicured lawns and inviting beaches, and tasty dishes that warm your soul. You’ll delight in an overflow of holiday cheer with cookies, bagpipers, and Santa sightings. Special events, from Nov. 24-Dec. 29, include breakfast with Santa, cookie decorating classes, and the sounds of the season from a talented bagpiper, will get you in the mood for the holidays. Continue to celebrate the season with your daily grand dining room breakfast buffet of steak and eggs or stuffed croissants. 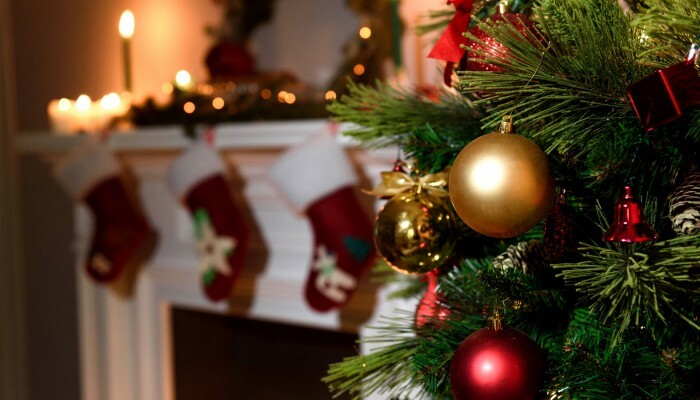 You’ll feel full and jolly when you return to your elegant suite decorated with Christmas stockings and ornaments. Located at the foot of the Blue Ridge Mountains, Prospect Hill Plantation Inn, in Charlottesville, VA, is your one-stop shopping destination for last minute holiday gifts and go to spot for lazy day activities and lounge-worthy accommodations. This 18th-century plantation offers 11 unique guest rooms and cottages that allow guests to relax and enjoy gorgeous views of the garden gazebo. The spacious parlor features a fireplace and cozy nooks perfect for playing board games, enjoying a book, or taking naps. Your private deck is ideal for enjoying a gourmet breakfast of Belgian waffles with warm peach compote and Applewood smoked bacon. After this feast, you’ll be ready to tackle your shopping list at the historic downtown mall walkway. Transforming into a winter wonderland, this market features 90 local vendors selling holiday goods and crafts. With so many wonderful gifts to choose from, you might be tempted to buy something for someone on your naughty list! Grab some hot cocoa and get ready to be amazed when you see all of the dazzling decorations in the Washington D.C area this holiday season. The area comes alive each December with the warmth of the holiday lights that adorn the streets and historic buildings, stores, and galleries of Wisconsin Avenue NW. Your stay at Woodley Park Guest House, which offers 14 comfortable guest rooms, is conveniently located 15 minutes from the Washington Convention Center, and many more favorite area attractions. Don’t forget to check out Georgetown Glow, a light art exhibition from Dec. 8-Jan. 7, which is free and open to the public. This stunning outdoor public art, shining bright in DC’s oldest neighborhood, gives a whole new meaning to the term season of light. Gather your loved ones together this holiday season at Maine Stay Inn & Cottages, in Kennebunkport, ME. The spirit of Christmas comes alive with sensational light displays and craft fairs in this quaint seaside village. You can go on horse-drawn sleigh rides, satisfy your sweet tooth on cookie tours, go caroling, and enjoy the musical performances at America’s second largest Christmas Festival, the Christmas Prelude Special, from Nov. 30-Dec. 10. Retire for the night in a luxurious suite with a fireplace and whirlpool Jacuzzi tub. In the morning when you dine on delicious breakfast dishes like carrot cake pancakes or savory French toast with poached eggs, you will give thanks to all of the festive family-centered holiday trimmings in this warm and welcoming town. 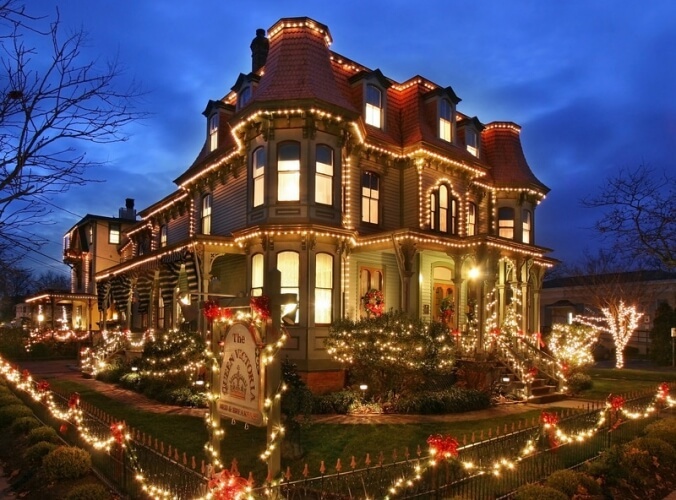 Recall holidays past and create new memories at The Queen Victoria Bed & Breakfast, located in Cape May, NJ. Choose from 35 lovingly restored rooms and suites at this award-winning Distinguished Inn of North America. Cape May has the largest collection of Victorian frame buildings in the U.S. The picturesque porches and comfortable parlors are made for relaxing and enjoying complimentary teas, sweets, and hot chocolate. 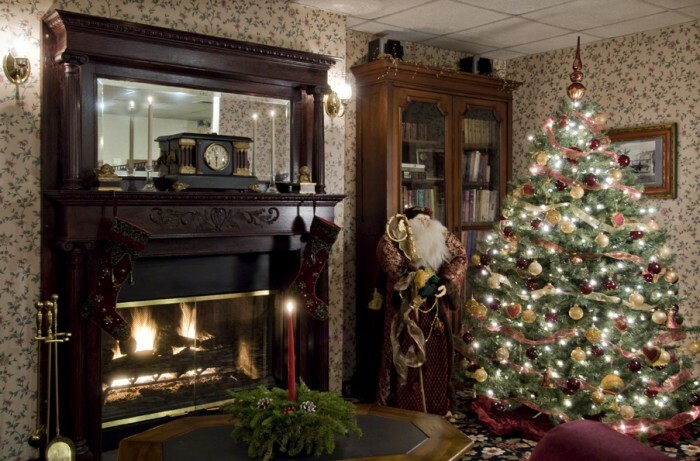 The beautifully dressed inn, wrapped to perfection in Christmas decorations and providing cozy comforts and warm hospitality, is a gift that will make your Cape May holiday one to remember. Dressing up in your holiday best makes this time of year all the more special, festive, and fun. At Fairbanks House, in Amelia Island, FL, this 1885 Italianate villa pulls out all the stops to dress up the guests rooms, public areas, and grounds in grand Christmas style. After enjoying the scenic decorations on a Christmas Eve carriage tour of the beautiful Fernandina Beach Historic District, settle in for a delicious meal of gumbo or Amelia Island shrimp and grits at Joe’s Second Street Bistro. Wake up Christmas morning to a special pumpkin pancake gourmet breakfast as you admire your seasonally decorated Christmas tree and unwrap special stocking gifts, courtesy of the inn. This Christmas, celebrate the favorite time of year at a B&B that gifts its guests with generous hospitality, and is always dressed to impress for the holiday season. If the scent of freshly baked cookies and treats is your favorite part of the holidays, then the 21st Annual Inn-to-Inn Cookie Tour at Inn at Ellis River, in Jackson, NH, is the only present you’ll want to receive this year! On Dec. 9 and 10, visit 10 inns and sample candies, treats, and all things wonderful made with sugar. Sleep off your cookie coma in a lovely room with balconies overlooking the river or gardens. In the morning, you might have to loosen your belt before you enjoy your breakfast of baked pecan praline French toast with whipped cream, but it’s worth it! You’ll be sent home with all of the recipes for the treats featured on the cookie tour, so don’t forget to send a Thank You letter to Santa for helping you can keep your sugar high through the New Year! This entry was posted in Holiday Getaways, Special Events, Specials & Packages, Winter Escapes by BnBFinder. Bookmark the permalink.